In the food and brewing industries, you can count on there being odors. And while some of the smells can be pleasant, foul smells can cause serious problems. In the food and brewing industries, you can count on there being odors. And while some of the smells can be pleasant, foul smells can cause serious problems inside —and outside— a facility. It’s important to pinpoint how an odor is released into the air. It’s not enough to smell something and place a treatment system down just anywhere. Locating where in a process an odor is generated can help you in determining the most efficient way to centralize and efficiently treat impacted air. Anyone who’s been near a brewery knows that the air around these facilities sometimes smells pleasant. Most of the smells aren’t troublesome to neighbors. But in breweries with wastewater treatment systems on-site, unpleasant odors can form and cause problems. Hydrogen sulfide (H2S) and mercaptans are the most common; they form when brewing byproducts ferment in anaerobic conditions. For more about brewery odor control, read how BioAir Solutions developed an odor control system that eliminated offending smells coming from the largest brewery in Australia. Countless food processing operations generate odors, too. As in brewing, they’re largely not a problem for neighbors. In cheese plants, for example, generally pleasant odorous compounds are generated when casein, milk fat and lactose are broken down. But a classic example of the need for food odor control comes from cheese plants with wastewater treatment capabilities. As with breweries, the breakdown of byproducts in anaerobic conditions forms foul odors. The resultant odors depend on the type of milk, the bacteria present in the milk and which of the above elements are broken down. Your odor control professional can help identify the specific odors released by your processes, but common compounds include reduced sulfur compounds (RSCs), ammonia, various volatile fatty acids and alcohols. Another critical consideration is whether odor issues in your facility are impacting packaging or bottling operations. For example, poor ventilation in a food processing plant can lead to odors seeping into packaging areas or other critical spaces. The same compounds that cause odor problems can also impact equipment in a facility. H2S is notorious for being corrosive in addition to its foul smell. In brewing, sulfidic compounds and mercaptans are common byproducts of fermentation that become either bound up or eliminated naturally under normal circumstances. But dirty equipment or an undetected bacteria infestation can lead to increased production of these compounds that cannot be eliminated naturally. To begin developing an effective odor control solution, it’s important to quantify odor problems both inside and outside your site. A BioAir odor control scientist can collect data to learn what odors are emitted from your facility, how concentrated those odors are in the air and to what extent the impacted air affects neighboring development. It’s also important to know whether an odor or emission is subject to federal, state or local regulation. We use this information along with the data we collect to design custom food or brewery odor control solutions that eliminate nuisance odors and comply with any applicable statutes. There are many methods for controlling odors at breweries and food facilities, but it’s not a matter of just choosing the one that sounds best. Different odor treatment technologies should be used to treat different problems. And it’s not just about the odorous compounds; the layout and inner workings of a facility also play a role in determining which brewery or food odor control method is most appropriate. 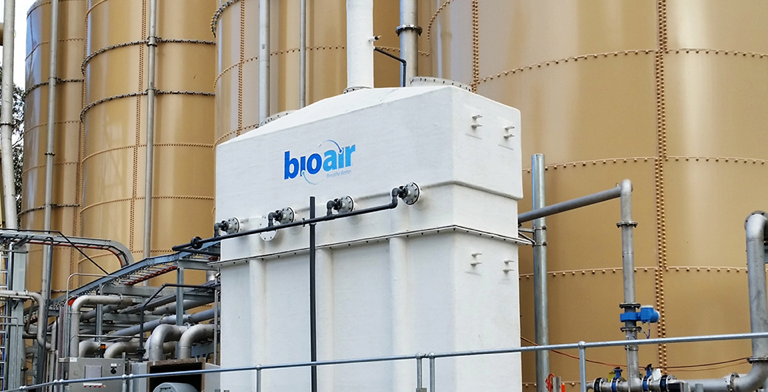 BioAir’s odor control scientists can work closely with facility managers to understand a site’s ventilation so that impacted air can be collected, centralized and treated as efficiently as possible. They also examine a facility’s layout and recommend the location of treatment equipment based on what’s most cost-effective, what fits your available space and what’s least disruptive to plant operations. Water availability is also key. BioAir Solutions offers a range of odor control equipment that includes biotrickling filters which use irrigation water. We like to recommend those systems because they’re effective, efficient, sustainable and come at minimal operating costs while being healthy for the environment. But if water isn’t readily available on-site, we may recommend something else. BioAir Solutions provides close support for customers in the food processing and brewing industries. From our initial site visit to our final post-startup tests, our experts are committed to fully understanding odor issues and crafting custom solutions. Each facility is unique; each odor presents its own challenges. One size doesn’t fit all. We developed our BioAir Complete® program with the nuances of every site and every problem in mind. Learn more about how we tackle odor challenges by reading our introductory guide to industrial odor control. To talk to one of our experts about a specific problem you may have, contact us now.